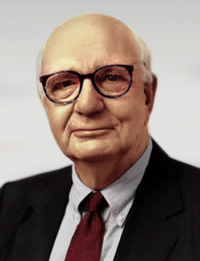 Paul Adolph Volcker, Jr. (born September 5, 1927) is an American economist. He was Chairman of the Federal Reserve under Presidents Jimmy Carter and Ronald Reagan from August 1979 to August 1987. Mehrling: So you didn’t read at that time the classic banking texts, for example, Bagehot’s Lombard Street? Volcker: I don’t remember the names of the books, just being in London. In those days I used to read The Economist and the Financial Times, so I kept up with what was going on in the money markets. Federal Reserve chairman Paul Volcker essentially eliminated M1 as a target indicator. His successor, Alan Greenspan, eliminated M2. On the other hand, in the past year or two, Greenspan has said on various occasions that maybe we should reconsider using M2. The trouble is that all these measures of money cannot be relied on because the velocity of money changes. It is quite unstable. This page was last edited on 2 April 2017, at 12:03.